A Big Asteroid Just Flew By, And Guess What? More Are Coming : The Two-Way A rock the size of three football fields passed relatively close to Earth. It wasn't a surprise, and neither will be the arrival of others. NASA has a calendar if you'd like to keep track of what's coming. But remember: Some space rocks, such as the meteorite that exploded over Russia last year, aren't expected. 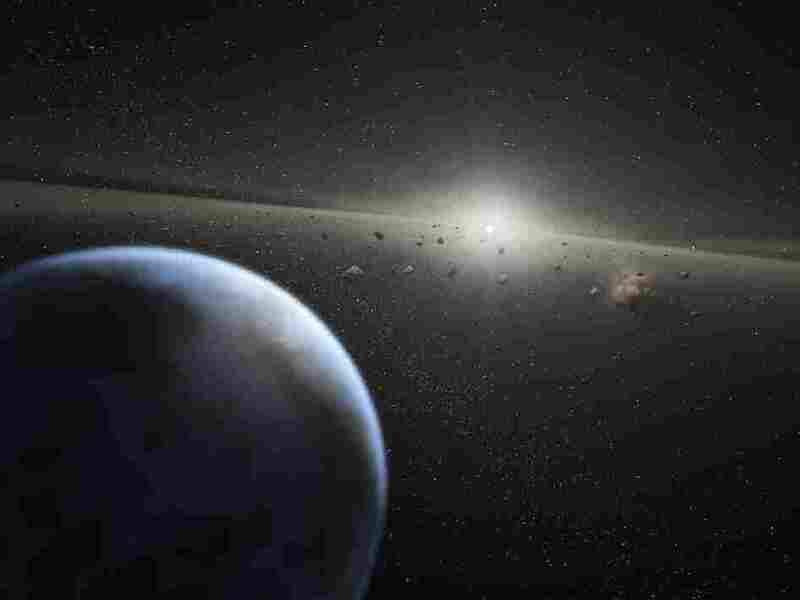 An asteroid that's about the size of three football fields flew past Earth on Monday, coming within 2.1 million miles. That was near enough to generate headlines such as this, from Reuters: "Earth marks close encounter with enormous asteroid." The fly-by from the rock known as 2000 EM26 wasn't a surprise. The asteroid was first observed, as the name implies, in 2000. Its arrival was also promoted by the science website Slooh.com, which was webcasting as 2000 EM26 came by and has posted the video of its coverage. NASA's On Alert For Big Scary Asteroids. What About Smaller Ones? Perhaps because 2000 EM26 arrived close to the one-year anniversary of what happened in Russia last February — when hundreds of people were injured as a meteorite exploded in the sky — it may have gotten more attention that it might have otherwise. But a blogger known as Astro Bob points out that "a week ago on Feb. 10, the larger asteroid 2006 DP14 (2,395 feet / 730 m) made an even closer shave at 6.2 lunar distances. 2014 BR57 will pass closer yet at 4.4 times the moon's distance on Thursday." Translation: The asteroid that flew past on Feb. 10 came within about 1.5 million miles; and the asteroid headed this way on Thursday will come within about 1 million miles. If you want to mark your calendar for asteroid arrivals, by the way, NASA's "Near Earth Object Program" has a schedule here. But here's a not-so-reassuring reminder: The meteorite that did so much damage in Russia one year ago wasn't on anyone's list of objects being tracked through space. It came as a surprise. Related: What's the difference between an asteroid, a comet, a meteoroid, a meteor and a meteorite? NASA explains here.